Eleanor Bullis, a partner with John Rogers Sr. of Rogers Real Estate in Northborough, has been a busy woman since her election as president of the Greater Worcester Board of Realtors. It took us several days to reach her because of her activities with the firm and the board. The native of Ogdensburg, N.Y. has been with the company for 17 years. She arrived in this area when her husband was transferred to Worcester as salesman for a firm, which handled supplies for municipal water departments. Eleanor said “I bought and sold four homes in less than six years while my husband was being transferred around the country. And that’s how I got started in the real estate field.” The Bullis family purchased its home in Northborough through the Rogers Agency and John mentioned that he was looking for a broker. Thus began a long and happy relationship with the industry. There are now seven brokers in the Rogers office selling and listing all types of properties although at times the country type of transaction predominates. “It’s a rewarding and challenging field in which you can reach any height and you can set your own limitations,” she says. A former governor (four years) of the Women’s Council of the National Association of Realtors, Mrs. Bullis says there are over 200 members on the Worcester Board, “close to 50% of them are women.” She joined the board in 1962 and at that time was only the 17th woman to do so. Last year she was regional vice president of the Women’s Council, primarily an educational group, which seeks to upgrade the Realtor movement, especially among women. Eleanor’s election as president marks the first time in the board’s 53-year history that a woman has headed the organization. Also in 1974, she served as vice president of the board and has been secretary of the Greater Worcester Multiple Listing Service. As chairman of the Make America Better committee, she encouraged members to donate trees for planting in each of the cities and towns which make up the board’s area. She estimated that there has been 75% participation with 44 offices involved. The project is being completed this year. Another of the M.A.B. projects was an art contest in the junior high schools in the county with Make American Better as the theme. It attracted over 100 posters and the five winners were awarded U.S. Savings Bonds. In addition to the local, state and national Realtor groups of which she is a member, Mrs. Bullis is also affiliated with the Realtors National Marketing Institute and the National Farm and Land Institute. She noted although there presently is no chapter for the NFLI in this state, one is in the process of being organized and has held several preliminary meetings. The International Real Estate Federation, made up of Realtors in this country and those who hold similar professional ranks around the world, must invite you to become a member. Eleanor received hers in 1969, a high honor for any Realtor. 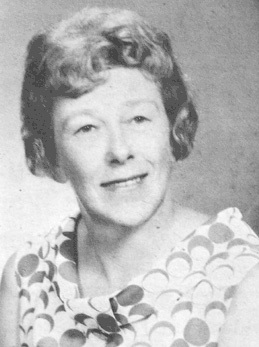 Her peers on the board also honored her in 1972 when they chose her as the board’s Realtor of the Year. She holds membership in such other organizations as the Worcester Chamber of Commerce, Northborough Historical Society. Northborough Women’s Club and the League of Women Voters. When asked about her hobbies, she replied, “I enjoy sewing, swimming and gardening, mostly illusions at this stage of life.” The Bullis family includes three sons and 10 grandchildren.